Does your husband enjoy a relaxing with a beer? This is the gift for your next anniversary. 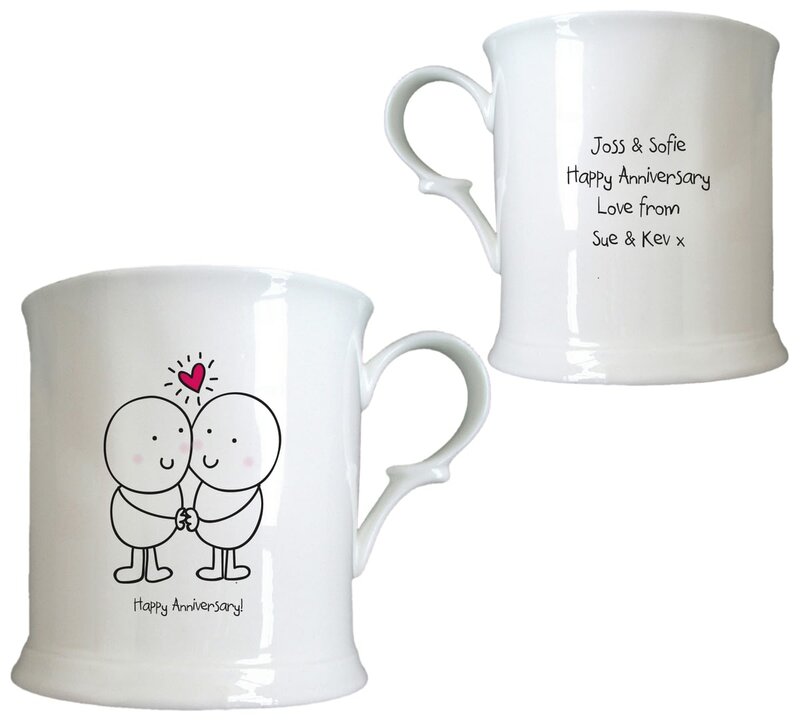 Whether he drinks from it, or sets it on the mantle as a reminder of the years you've spent together, he's sure to love this personalised tankard. Let Chilli and Bubbles help wish someone a happy anniversary. The cheeky loving characters make up a cute and romantic design, all that's left to do is add your own message which we engrave beneath them. For a happy couple with many more years to enjoy together. It's your birthday, eat cake and maybe have a cheeky cuppa. Chilli and Bubble know exactly how to help you celebrate a special birthday, and we include your message on the reverse. Stars and sparkles are the perfect way to congratulate a special someone, and with this half pint tankard you can celebrate in style. Whether used for a cheeky drink, or as a decoration to mark the event, this china tankard adorned with our cute character will be treasured long after the event has passed. Our Chilli and Bubbles character is here to celebrate a graduation, complete with diploma, mortarboard and shiny stars. Adorable Chilli and Bubbles characters are included in the design on this china tankard, all that's missing is your own message of love which is expertly personalised underneath. Encourage a drink to say goodbye in style. 'Sorry to see you go' has never been said more perfectly than with this bespoke tankard. Does your husband enjoy a pint? This is the gift for your next anniversary. Christmas pudding is the perfect way to celebrate Christmas, and with this half pint tankard you can celebrate in style.